Milton Keynes - based copywriting and press relations company The Words Workshop publish a specialist magazine, "The Mover" for the removals and storage industries. To coincide with the launch of the magazine they required a content-managed website, on which a significant portion of the magazine content was to be published. The purpose of the website was to support the magazine, and to assist in generating revenue from on-line and paper advertising. Site design and templates were created to closely follow the format of the published (printed) magazine – ensuring a coherent look and feel for the two. The menu structure, news features and some custom "widgets" (drag-and-drop tools that can be used to provide website functionality) were provided by WyeTec, thus ensuring that this site was ready for population with the initial magazine content. Moreover, it was important to ensure that content was structured in a logical and extensible fashion from the onset – as future issues of the magazine got published, the volume of content held within the Sitefinity Content Management System was destined to grow significantly. 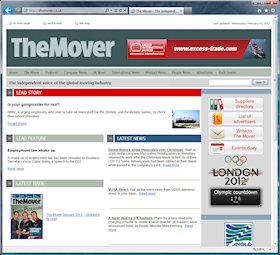 The design of TheMover.co.uk closely follows the layout used in the printed magazine, providing a coherent brand. News articles and other material are published every day, maintaining interest for site visitors and search engines, and thus building site traffic rapidly. With a minimal amount of instruction, copywriters at The Words Workshop were soon adding the content from their first publication. Fresh content is now added to the site almost every working day, a strategy that is already paying dividends. In less than 1 year the website was generating a healthy, and growing, level of traffic - and generating sufficient advertising revenue to turn a profit. Google PageRank scores are steadily increasing, and site performance is expected to continue to grow with the volume of high quality content being published. 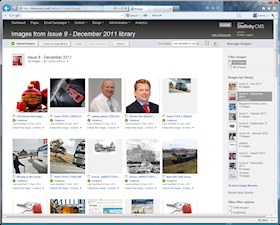 Behind the scenes, the Sitefinity Content Management system enables the site managers to author, organise and publish the increasingly large volume of web content in a structured fashion. To get the best results from the Sitefinity CMS, the site is hosted on one of WyeTec's powerful, low-contention servers, co-located in a fully fledged data house. The site is automatically backed up to an off-site resource. Contact WyeTec today to discuss how Sitefinity can empower your website.